We’ve had a doozy of a storm today. It started with rain last night, continuing through the night and the turning to snow in the morning. We didn’t have a lot of snow, but there was a lot of strong wind – strong enough to bring a large branch down from one of our trees. We have a three tiered gazebo and the smallest tier, right at the top was decapitated by the branch. The roof part is intact, but the part holding up the roof is damaged. Hopefully it won’t be too hard to fix. The storm continues, but the rain/snow has decreased somewhat and the winds have lessened a bit. It should all be over later tonight and tomorrow is supposed to be a much nicer day. 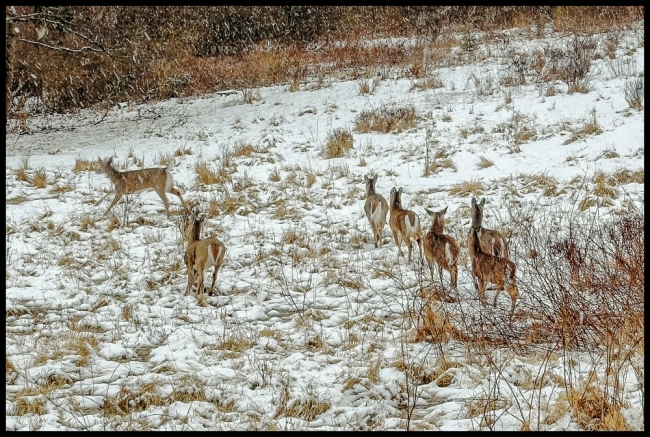 At the height of the storm these deer (there were about eight in all) appeared in the meadow outside our sun room. The storm didn’t seem to bother them much.